Leading Manufacturer of shirts from Gurgaon. 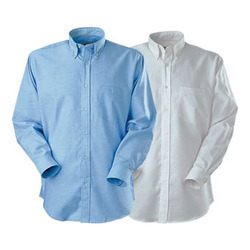 Shirts offered are available in quality fabric finish so as to provide for comfortable wear support. Made available in different color shades and design options, the durable fabric finish and quality dyeing support also make them last long without color fading issues. The finish parameters of these shirts can also be custom developed as demanded by the customers. Some of its features include available in various colors and design model choices, featuring smooth fabric surface, available in all size options. Looking for Formal Shirts ?